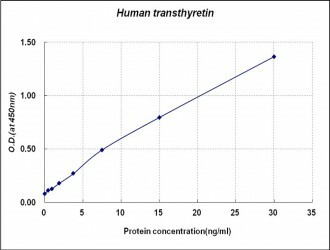 Transthyretin (TTR, prealbumin, 55 kDa homotetramer) is a thyroid hormone-binding protein that transports thyroxine (T4) from the bloodstream to the brain. TTR was originally called prealbumin because it ran faster than albumin on electrophoresis gels. TTR is produced in the liver and circulates in the bloodstream, where it binds retinol and thyroxine. TTR is suggested that plays an essential role in brain function. The protein consists of around 130 amino acids, which assemble as a homotetramer that contains an internal channel in which T4 is bound. Within this complex, T4 appears to be transported across the blood-brain barrier, where, in the choroid plexus, the hormone stimulates further synthesis of transthyretin. The protein then diffuses back into the bloodstream, where it binds T4 for transport back to the brain. TTR is known to be associated with the amyloid diseases senile systemic amyloidosis (SSA), familial amyloid polyneuropathy (FAP), and familial amyloid cardiomyopathy (FAC).